Let’s take it back to 4th of July weekend, 2016. 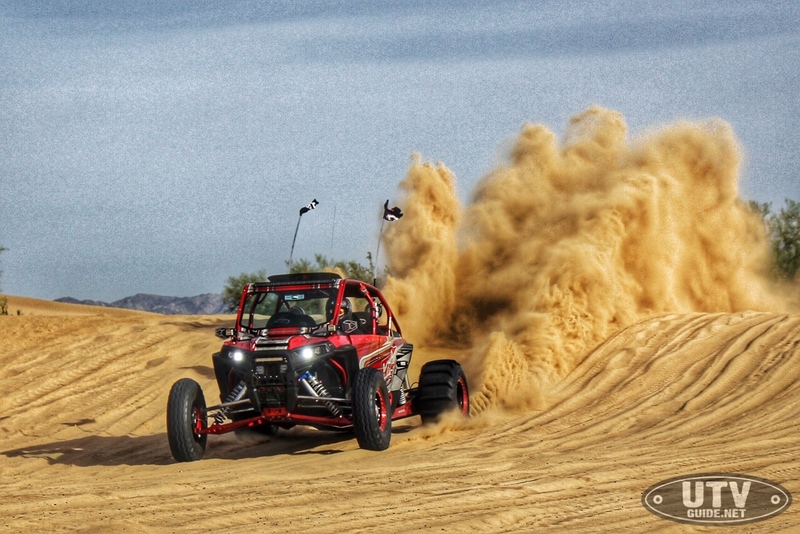 Chris and Rob Leaming, father & son of XTC Power Products and XTC Motorsports are enjoying a day off, celebrating America’s independence, and planning their next showcase UTV to build for the season. A looming idea of a Subaru-powered UTV had stuck with them since the Rhino days, but without building a full one-off chassis, XTC knew the frame couldn’t keep up with the power. Glancing over at the RZR XP4 sitting in the garage, it seemed the timing was finally right. 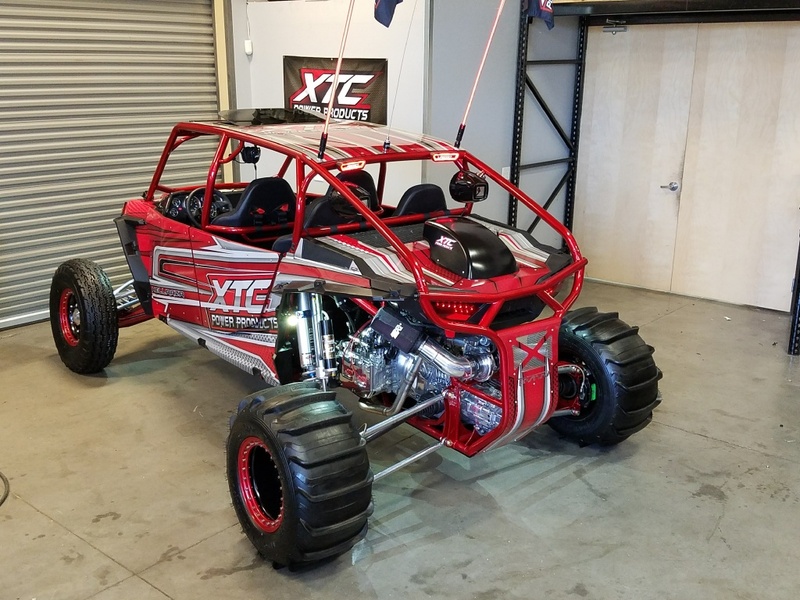 The crew at XTC called their local RideNow dealer and ordered up all of the factory frame, interior, and exterior pieces they would need to start the new build. 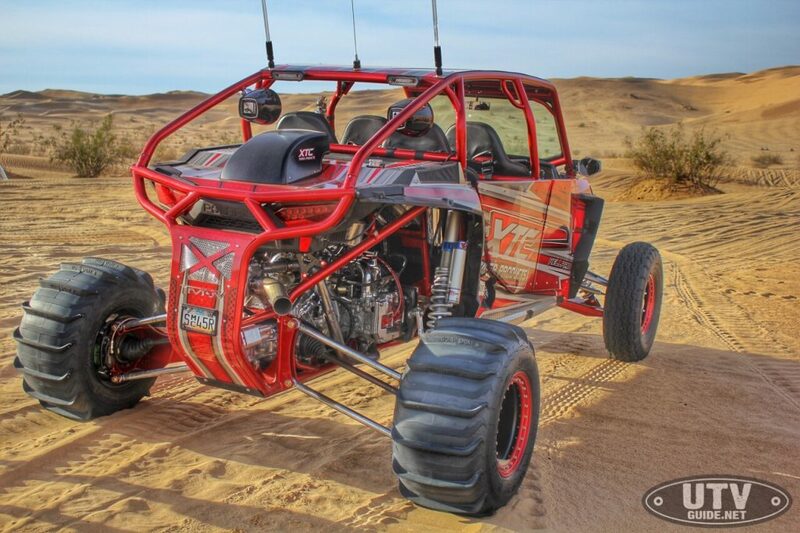 It would be far easier and cheaper not to start with a complete car, as not much of the RZR would remain intact. The partial frame was then trailered over to TMW Offroad in Mesa, Arizona. 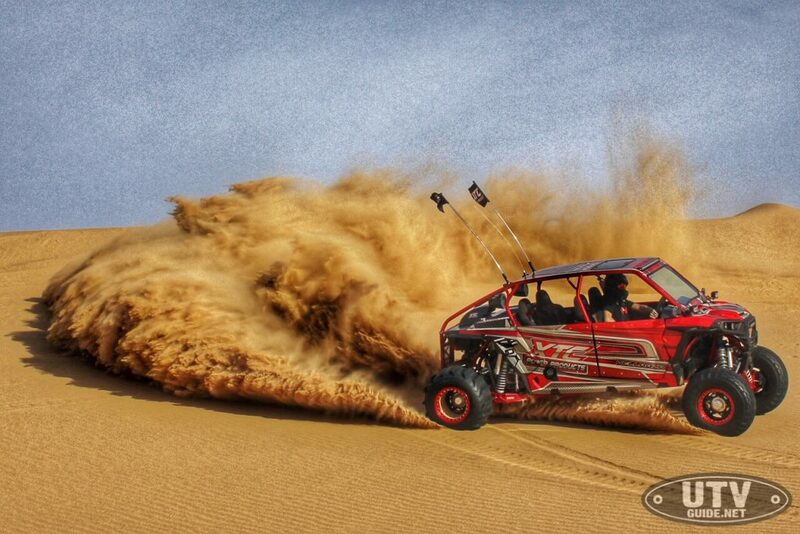 Once it arrived, Doug Tyler and his team of wild and talented fabricators began cutting gusseting, and lengthening the RZR’s chassis to accept what would end up being a 475 horsepower Gen 3 closed deck EJ25 Subaru motor. TMW is no stranger to UTV motor swaps, having recently created one of the most head-turning, gorgeous RZR transformations to date; the V8-powered Werewolf. With the experience they gained from that project, TMW constructed a fantastic chassis capable of harnessing a turbo 4 cylinder boxer engine, a Mendeola 2D 4 speed transaxle from a Funco sand car, and a long travel suspension kit capable of over 20 inches of wheel travel. The entire back half of the frame (from behind the rear seats) was lopped off and replaced with TMW’s nearly-modular frame kit. This allowed them to squeeze the motor and transaxle into the frame without anything hanging out of the tube work. With the fabrication work done, the car was shipped off to Precision Powdercoat Inc in Phoenix, Arizona. 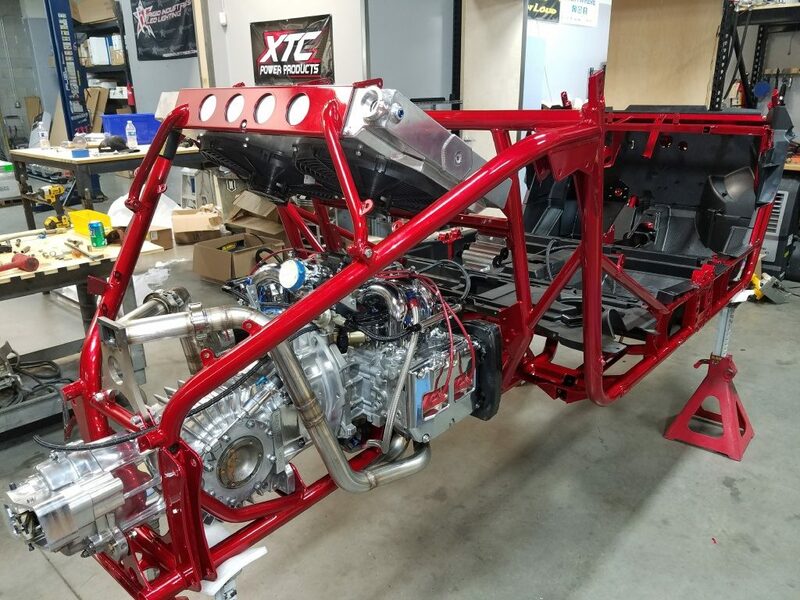 With a fresh coat of candy red applied, XTC took over the build and started laying out their wiring kits. 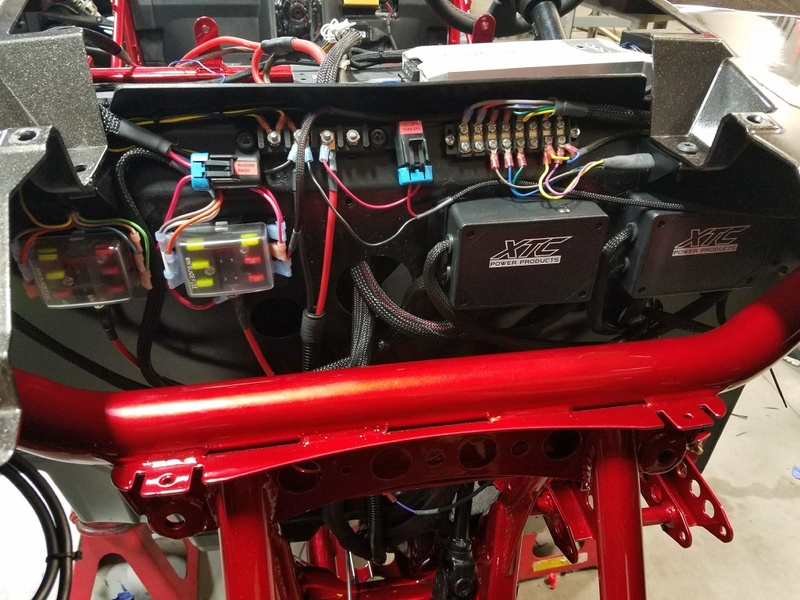 XTC Power Products specializes in wiring and custom vehicle design work, having built some of the cleanest UTV plug and play wiring kits we have seen. Their flagship kit, the PCS-72, was used to lay out the wiring for all of the Rigid lighting, offering a plug and play 6-port switched control kit that requires no splicing, cutting, or mangling of any OEM wiring. The kit is designed to make wiring accessories to your UTV a breeze- simply mount the control boxes, wire in power and ground from a battery source, and run all of your accessory power wires to the included post block. 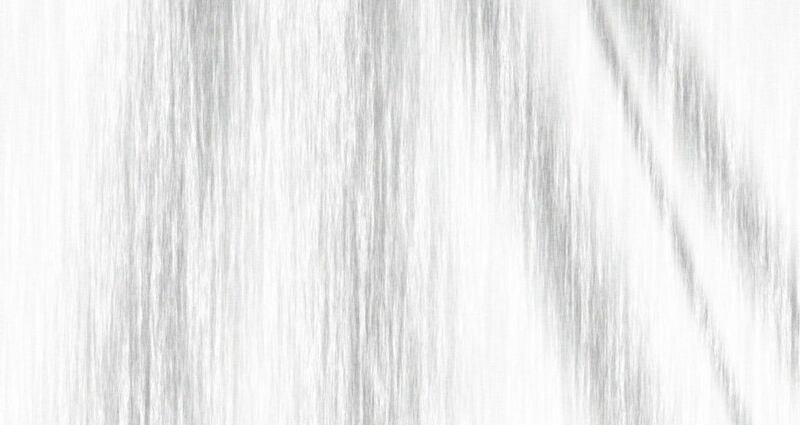 We have used the kits before, and they save a monumental amount of time. How much time, you ask? According to XTC, this entire custom build was wired up and ready for final assembly in one day. A PCS-44 power control kit handles the ignition, starter, and fan control functions for the Subaru power plant, with a PCS-1 plugged in to feed the Rugged Radios 660+ intercom and 60 watt radio set. XTC has power control solutions for any accessories you want to install on your UTV, buggy, truck, boat, or car. The fused and relayed accessory connections are an easy, safe, and reliable way to install any electronic add-ons to your vehicle. The $379 PCS-72S 6 switch kit comes with everything you need for installation, and adds strobing capability to the lighting circuits. Once the chassis work and wiring was out of the way, XTC began installing the engine and transaxle setup. The engine was fully polished before installation, and TMW built a custom set of turbo headers to fit the T5 turbocharger to the EJ25 engine. Routing the power to the wheels is a set of Gearone Mid Board hubs with massive 930 CVs and chromoly axles. Going to the larger buggy style hubs does add weight to the car, but it makes for a nearly unbreakable drivetrain for normal desert and dune duty. Four piston front calipers were also added to help bring the big HellRazr’s speed into check. To plumb the fuel system, the stock tank was modified to accept an external Bosch high-flow fuel pump. A Motec standalone ECU handles the programming for the Subaru motor. The 475 horsepower turbocharged 4 cylinder boxer engine was fitted with a new Gen 3 closed deck block, forged connecting rods and crank, half-inch head studs, and JDM Subaru heads. The whole package is good for about 110 mph on dirt! 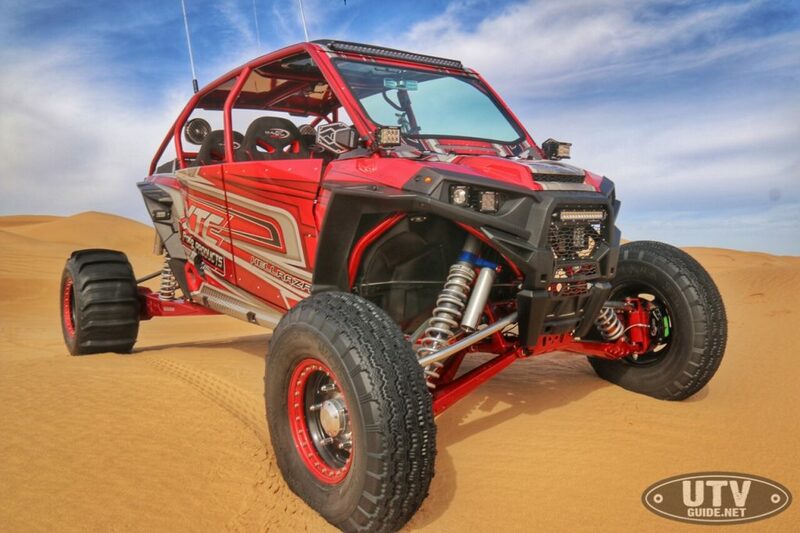 The RZR is street legal in Arizona as well, featuring XTC’s plug and play turn signal kit and a DOT approved glass windshield. With the engine, transaxle, wiring, and chassis parts all wrapped up, XTC turned to the final details. Rigid Industries lighting covers the entire car, as XTC and Rigid have been long time business partners. Lighting additions include a Rigid headlight kit, a 10” SR2 Drive light bar in the grill, 2 Dually XL spot lights hidden behind the grill, 2 Dually DSS (Side Shooter) pods on the A-pillars, SRM Flush-Mount fender light kit, 2 rear Chase lights, a 30” SR Midnight Edition roof bar, and a collection of rock and dome lights. Maybe XTC should have called this car the rolling sun? A TMW Offroad cage and door setup finalized the profile of the car. Inside, XTC lined the door panels with suede to match the Triple X suede bucket seats, draped in Crow 4 point harnesses. A tilt-up moon roof was added, along with an incredible Rockford Fosgate Stage 5 stereo system. The Stage 5 system features four 6.5” woofers with a 400 watt four-channel amplifier, a 10” slim mount subwoofer fed by a separate 700 watt amp, and a 2.7” digital display to control the audio system. This, too, was wired into one of XTC’s plug and play wiring kits. Wrapping up the interior is a GlazzKraft carbon fiber dash kit filled with AutoMeter gauges, XTC switches, and a Lowrance 7” GPS kit. The entire car is built with incredible attention to detail, down to every last nut and bolt. It’s a true show car that Chris from XTC routinely takes out; no trailer queens here. The short two and a half month build time is impressive when you consider how much work really went in to the HellRazr. 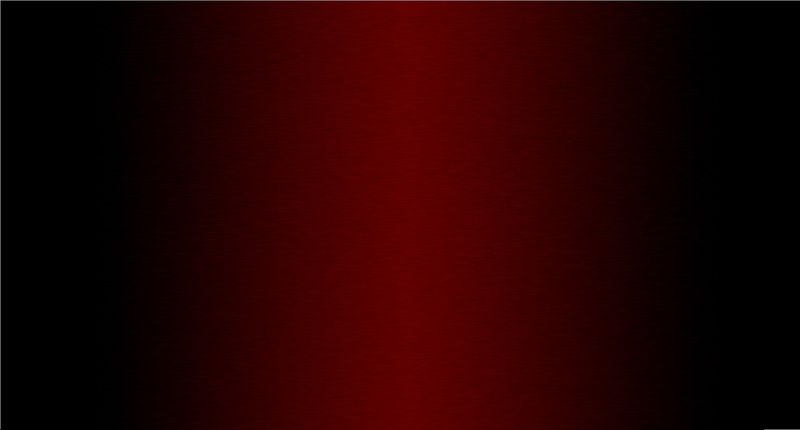 The entire car was then wrapped by Wolf Designs, draped in a gorgeous candy red vinyl that absolutely gleams in the light. 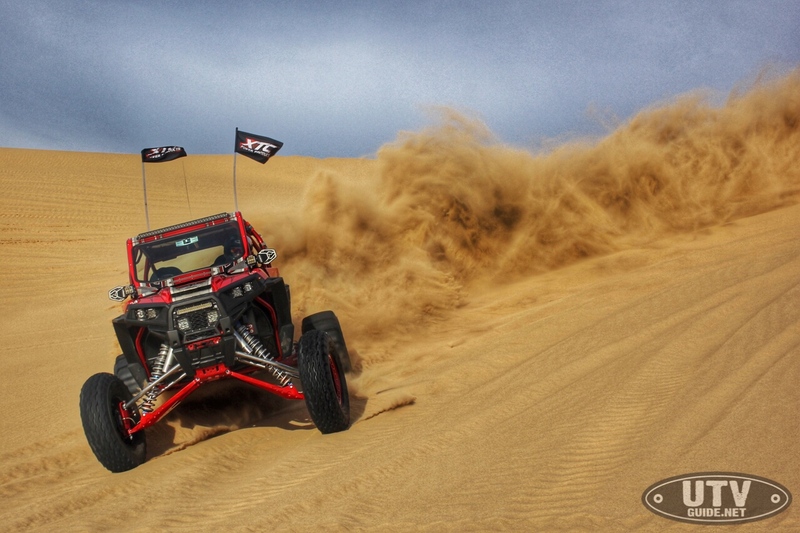 We caught up with XTC and the HellRazr at Camp RZR in Glamis, where the car went out for a few shakedown runs after its debut at the Sand Sports Super Show. 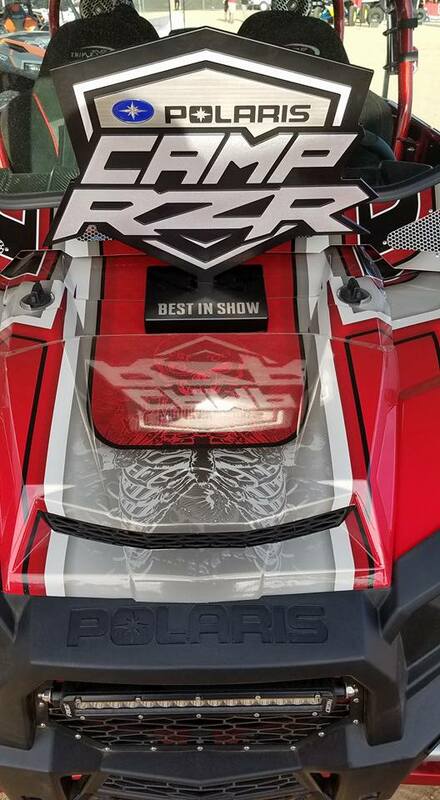 The HellRazr went on to win Best In Show at the Camp RZRShow ‘N Shine Competition. The car made some incredibly fast passes up the hill, and was running its original tune setup at 14 psi when some bottom end noise started to occur. It wasn’t a surprise to Chris, as the engine had previously served plenty of years bolted into a Funco buggy donor car. After the trip, the engine was pulled out of the frame and shipped to Out Front Motorsports, a California-based Subaru specialty shop. The engine was fortified and built to withstand a whopping 20 psi of boost pressure, pushing its total power output near 500 horsepower. With a UTV that attracts this much attention, XTC knew this car had to really run, and run it does. 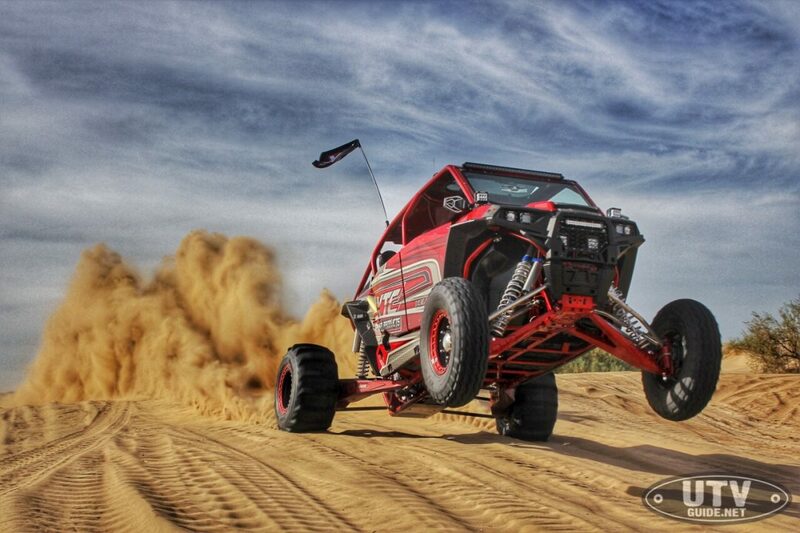 The TMW Offroad custom long travel suspension is controlled by Walker Evans Velocity Series coilovers. The 2.5” coilovers are the same length front and rear, made possible by mounting the front shocks to the lower A-arms instead of the uppers. 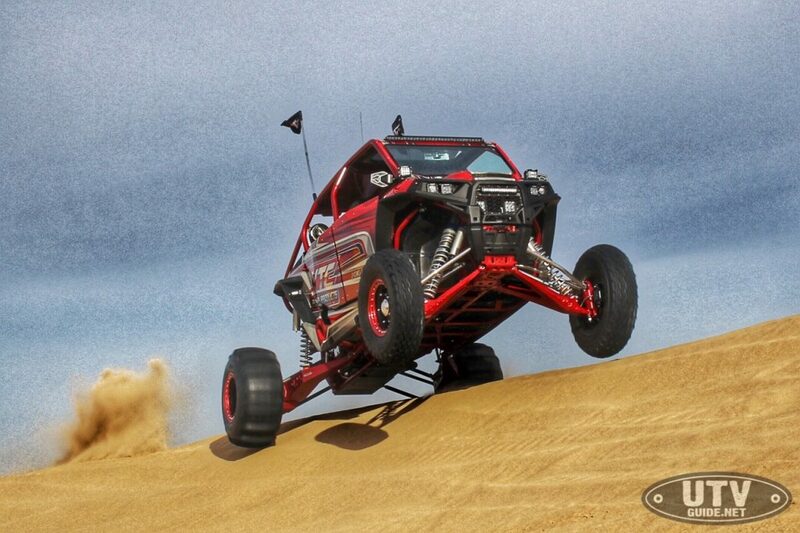 This setup allows proper geometry for ease of tuning, and it really helps the HellRazr put the power down and float over big sand whoops and through G-outs. For its first sand outing, XTC bolted up the same tire and wheel setup they had on the Funco buggy, with 30” tires on 15” wheels. The car definitely needed more paddle, so Chris ordered up a set of 34” tall paddles and custom wheels for its next dune trip. The beauty of the Subaru engine platform is its low center of gravity. The entire engine is only about a foot tall, with cylinders that are opposed horizontally and laid flat, as opposed to an inline or V configuration. This allows the engine to be positioned low in the frame, with only the intake and coolers positioned above it. An enormous CBR aluminum radiator and custom intercooler keep the engine running cool, with a custom bed scoop feeding air to the vital bits. It is all packaged beautifully in the modified TMW frame- so much so, that it almost appears factory. In this day and age, built cars are a dime a dozen. When something like the HellRazr comes along, it’s a cause for celebration, as it definitely strays far from normal. 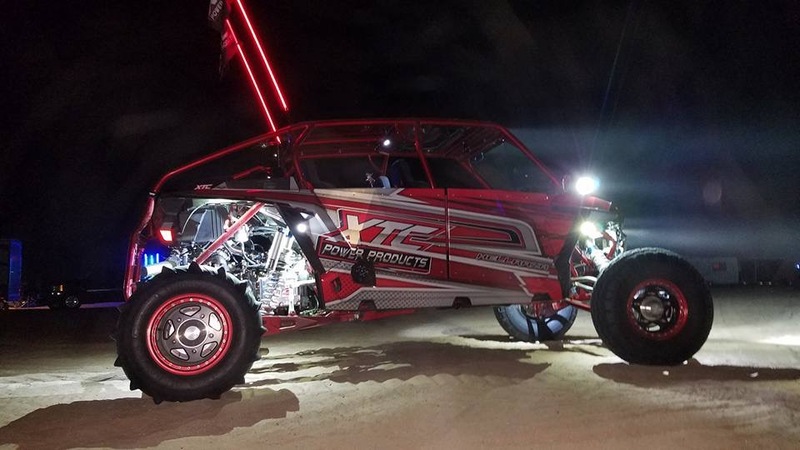 We applaud XTC Power Products for their efforts and achievements here- this is a seriously fast, reliable RZR(ish) that will continue to turn heads for a long time to come. ← Is There Such Thing as ‘Too Many Switches’?